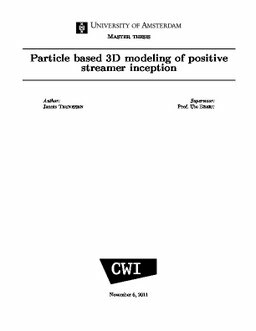 In this report we present a particle based 3D model for the study of streamer inception near positive electrodes in air. The particle code is of the PIC-MCC type and an electrode is included using the charge simulation method. An algorithm for the adaptive creation of super-particles is introduced, that keeps single electrons in regions of low density. Photoionization is included as the source of secondary electrons. We discuss the model implementation and present results on avalanche statistics and the inception process in general. Although the inclusion of the electrode is currently still somewhat inaccurate, the model seems to be a powerful tool with which one is able to study the full physics of the first few nanoseconds of a discharge. We present simulation results that show good agreement with experimental observations: first an initiation cloud forms around the electrode tip, which later starts to destabilize into streamers. Teunissen, H.J. (2012). Particle based 3D modeling of positive streamer inception . CWI. Department of Modelling, Analysis and Computing [MAC]. CWI.